I’m a borderline weather geek. I don’t just like to know the temperature — both inside and out — I even keep a hydrometer in my home so I can keep tabs on the humidity, cause you know, that’s important. 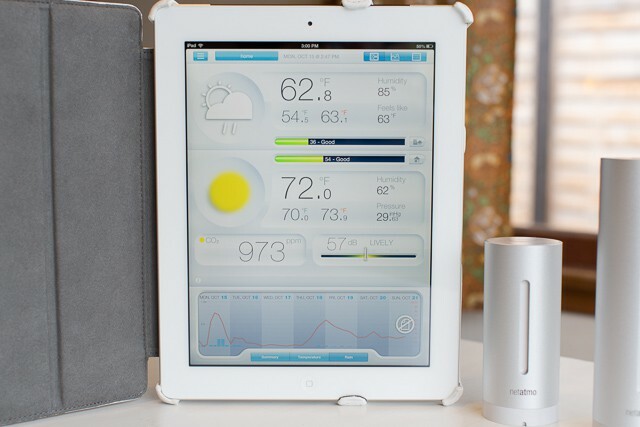 So naturally, when I found out about the Netatmo Weather Station ($179), I was a little excited. 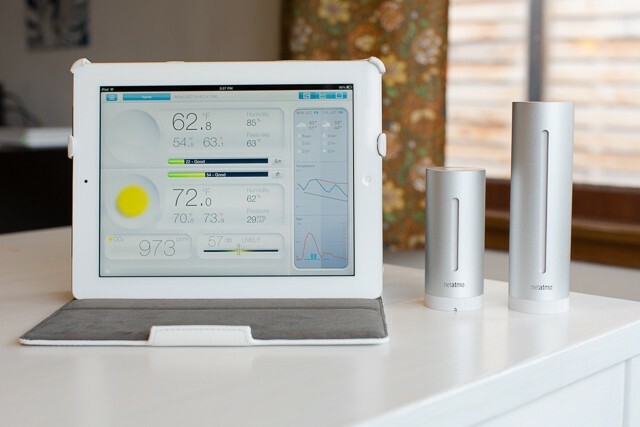 With its indoor and outdoor weather modules, the Netatmo tracks a lot more than just the current temperature. 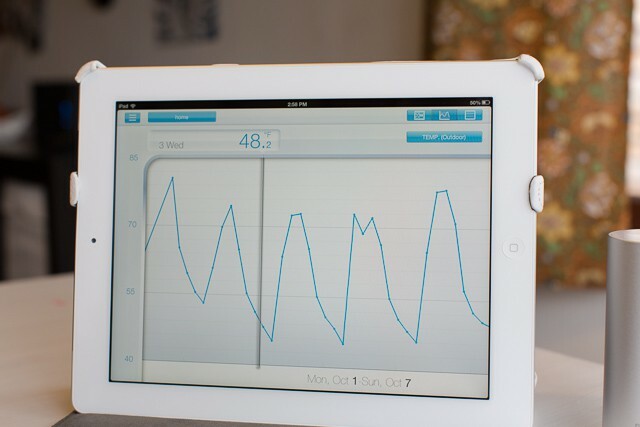 Plus, unlike my crappy $5 hydrometer, it relays all its readings in a unified way, presented beautifully in an iOS app optimized for both my iPhone and iPad. 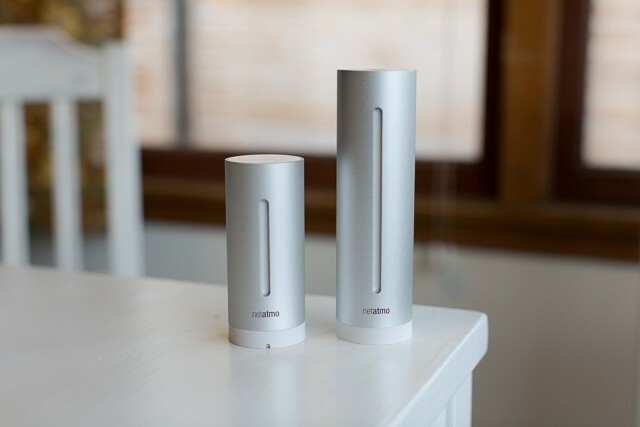 Once connected to your network, the Netatmo indoor module collects information from the outdoor sensor, and then, along with its own indoor readings, sends that information to the Netatmo servers. 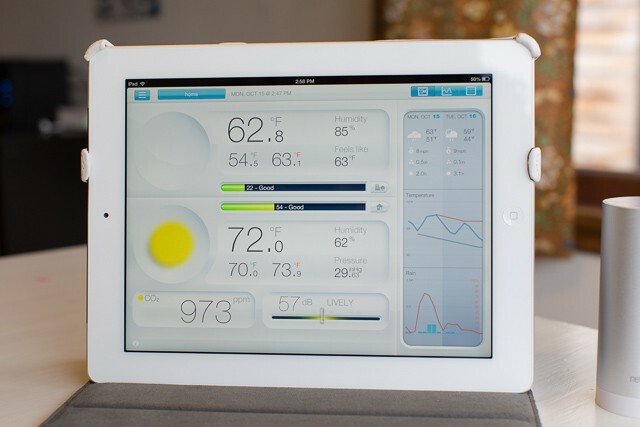 That’s handy because it allows you to connect and observe weather info on any iOS device you own. Plus, since that data is continually being uploaded to the cloud, you can view it graphed over small or large amounts of time. Yes, I’ve been geeking out. I love it when products look as good as the iOS devices they interact with, and that’s definitely true with the Netatmo Weather Station. Both the indoor and outdoor units are hewn from silver aluminum and white plastic, and look great sitting on a shelf. 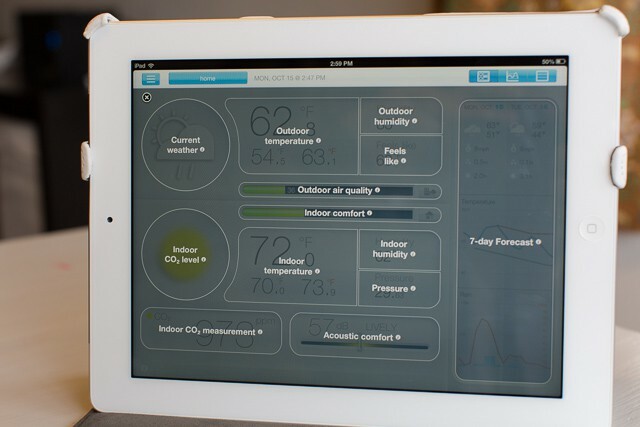 But it’s clear a lot of design attention also went into the Netatmo’s user experience. Getting the weather modules setup is a super simple process, and though the units are always taking measurements on their own, initiating a measurement manually is as easy as tapping the top of the indoor unit. 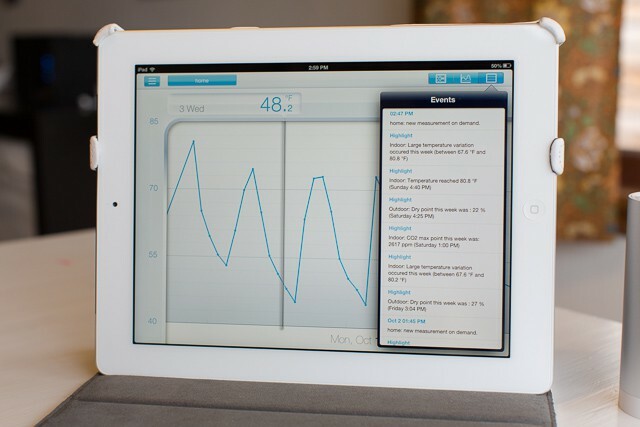 The iOS app is also simple to use, and looks as beautiful as the weather modules sitting inside and out. But looks aren’t everything. The Netatmo apps provides insights into a good set of weather and atmosphere information, including inside and outside temperature, barometric pressure and rain forecasts, indoor sound and and Co2 levels, and of course, the current weather conditions. And if you forget what’s what, like I often did, the info-key panel you can bring up explains what information is being presented, and what it all means. Though not a hugely persistent issue, I did notice that, sometimes for minutes, sometimes for chunks of hours at a time, my Netatmo modules would stop recording, leaving big blank spots in my outdoor temperature graphs. I’m not sure if this issue was a result of the Netatmo outdoor module not being able to connect to my Wifi network, or if the Netatmo site it connects to was having issues. I asked Netatmo about the problem, and they weren’t sure either, though suggested something on my network could be causing interference. I also noticed that the outdoor module liked to be somewhat close the the indoor unit it connects to. It had trouble connecting through the walls of my house, and would only work well consistently when I placed it near a window close to my indoor module. I was a little underwhelmed with its wireless range. And finally, though not a necessarily a negative, I’d like to see the Netatmo app add more kinds of weather information. Though the basics are fine for me, I know how hard-core some weather trackers are, and for them, the more data the better, though many times such extra info comes at the expense of a beautiful user interface, which the Netatmo definitely has. If you, like me, love tracking the atmospheric conditions in your home and yard, you’ll likely quite enjoy having a Netatmo Weather Station living on your network. It’s easy to use, and the excellent iOS app will display all those wonderful weather tidbits in a tidy, easy-to-digest format so lovely, you’ll forget you’re actually just looking at data. I gotta go now, it’s about to rain.